The Lower Modernisms – 045. 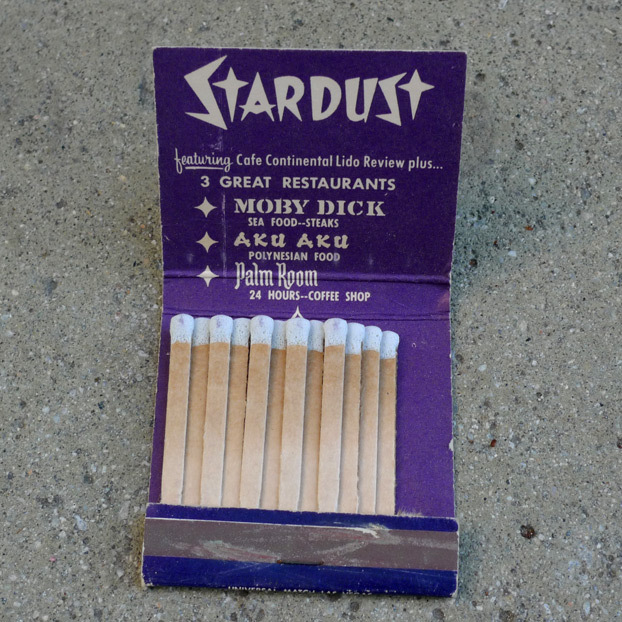 Matchbook Delight! Part 11, Stardust Hotel and Casino. April 1, 2012 by James Black. 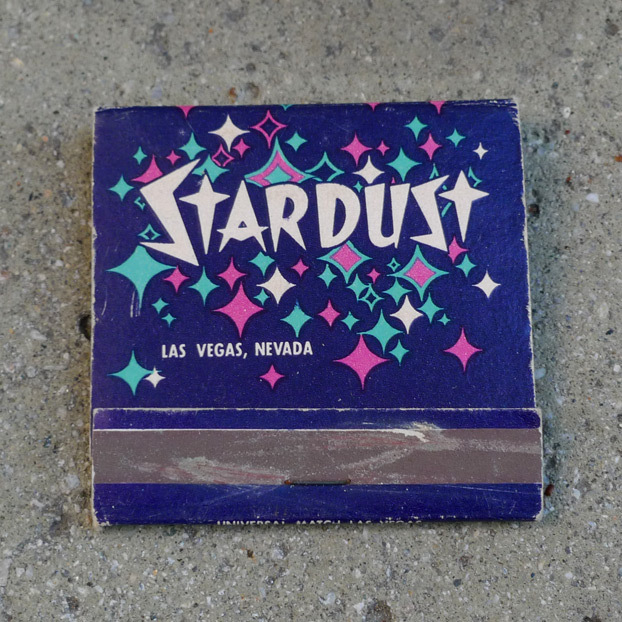 The Stardust was an epic work of the Lower Modern, a hotel-casino that exemplified the “Decorated Shed” advocated by Venturi and Scott Brown in Learning from Las Vegas. The graphic elements of this matchbook, rendered in cleverly harmonizing hues with a three-color print process, echo the forms of YESCO’s great 1960s electrographic sign. There are two key components to this graphic identity. The nonverbal element is a random array of a shape that can be called a “stardust”: a four-pointed star with points on axis and concave sides. This lomo shape vaguely recalls the effect of twinkling lights or of the streaky appearance of electric lamps photographed through a defocused lens. The second component is the “STARDUST” logogram, the letterforms made up of sharp shards. The Ts in particular resemble the stardust shapes in the starry array, and bring sputniks to mind. 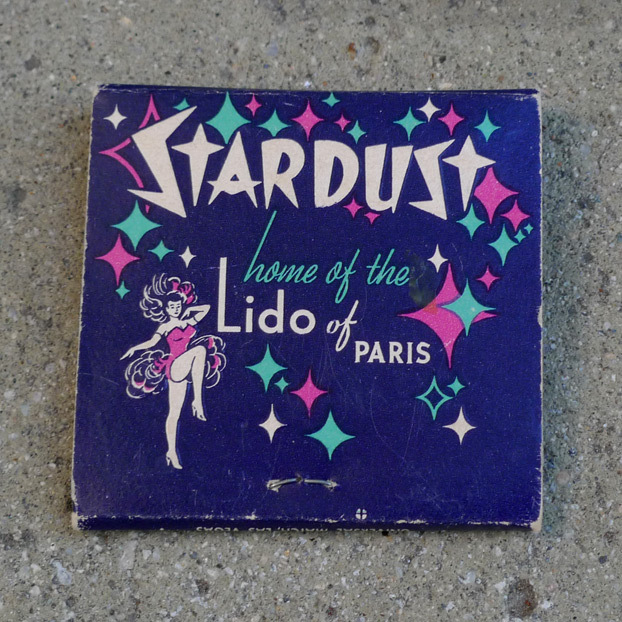 Throwing showgirls together with a space-age imagery, Stardust played up a double entendre of “star” to evoke and conflate outer space and celebrity. In the same way that Disneyland comprises a collection of distinct fantasy environments, the Stardust resort brought together an eclectic mix of themed restaurants, and the inside of the book correspondingly throws together a collection of eclectic typefaces.